If you live in or around Chicago, you are already accustomed to putting up with almost every form of weather that exists while traveling. Sun glare is one of the most frustrating hazards for Chicagoans because regardless of the season, the sun will always rise and set on the city. 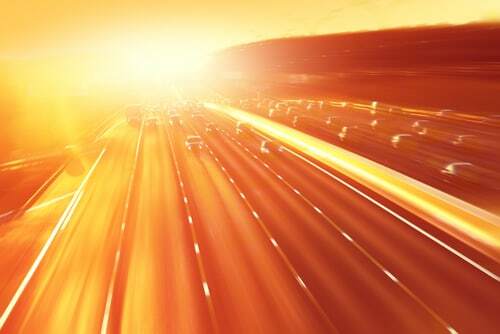 Drivers encounter the most sun in the summertime, however, motorists need to take special care to guard themselves against sun glare and recognize how it may impact others on the road to prevent automotive accidents. At the end of the day, it is the responsibility of drivers to travel safely. The experienced attorneys at Rosenfeld Injury Lawyers LLC routinely represent people injured in motor vehicle accidents in and around Chicago and are familiar with the role that sun glare plays in collisions. Though some drivers at fault for the accident may attribute the cause of the collision to sun rays, we use expert investigators to prove the driver's responsibility. If you were involved in a Chicago car accident where sun glare may have played a role, we invite you to discuss your case with our team without any cost or obligation to you. Sight is probably the most important sense motorists need when driving. When the motorist's sight is impaired, they are immediately placed in a precarious situation. Most sun glare accidents occur at intersections; primarily because the driver blinded by sun glare failed to see traffic control devices or others sharing the road. These are some of the most common scenarios that create this type of accident. A driver is unable to see a stop sign or traffic light and collides with another vehicle in the intersection. These accidents can be serious or fatal when traveling at high speed. The affected driver is unable to see his or her lane position or the road itself and may drift from the lane in a manner similar to how drunk drivers swerve. The result could be as minor as a side swipe accident or as major as a head-on collision when the driver travels into oncoming traffic. Sun glare makes it difficult to locate other cars on the road. This often causes blind spot accidents because if the driver checks for blind spots, the glare makes it difficult to see the other vehicle. The sun impairs the driver’s ability to see the tail lights of the car immediately ahead. This becomes problematic when the lead vehicle slows or comes to a stop and may result in a fender bender or rear end collision. The driver makes a left turn into oncoming traffic because he or she does not see the oncoming vehicle(s). The severity of these accidents may vary depending on how fast the other vehicle is traveling or cause multi-car accidents. Pedestrians crossing an intersection are struck because a driver fails to see them. Sun glare may cause drivers to be involved in accidents with bicyclists as well for the same reason. The aggravation of rush hour traffic may frustrate drivers enough without the added glare from the sun. However, it is noteworthy to recognize that the conditions that present the worst glare occur during the morning and evening rushes each day. At this time of day, the sun is low on the horizon at an angle that makes glare a menace to drivers who are traveling eastbound or westbound. Recognizing this may make it easier for drivers to protect themselves and prevent being involved in accidents. Consider following these helpful tips for handling glare. Try not to drive with a dirty windshield as this amplifies the effects of sun glare and the dirt itself can obstruct your vision. Clean your windows often and always check your windshield fluid level so that you don’t run out when it is needed. Wear sunglasses designed specifically to protect your eyes from the sun. Not only will this help you fight the glare, but it is a known fact that UV rays can be harmful to your eyes and that sunglasses will mitigate the toll the sun takes on your eyesight. Never look directly into the glare of the sun or a reflective object. This will not only irritate your eyes but it can create temporary darkened spots in your vision that make it difficult for you to see. While sun glare is a common concern during the summer, keep in mind that snow accumulation during the winter can result in winter glare. Snow can be extremely reflective and bright. Treat sun glare like any other common source of obstruction to your vision such as fog, heavy rain or drifting snow. If you are having trouble seeing ahead, slow down so have time to react should a pedestrian or vehicle move into your pathway. Do not be afraid to exercise your legal rights. Regardless of weather or road conditions, drivers are accountable for the accidents that they cause. If you are involved in an accident because a driver did not see you, you are entitled to receive financial compensation to pay for your medical bills and property damage. For more information about laws applying to your case, contact the Chicago car accident lawyers at Rosenfeld Injury Lawyers LLC to learn more about your legal options.